Every holiday season, many galleries put on something called a “mini” show. All artists belonging to the gallery bring in several small works to display during the month of December (and sometimes November). It’s a great idea, as smaller art is priced accordingly, and may provide someone a chance to purchase an affordable piece to give as a very special gift. So excited, as Hood Avenue Art in Sisters, Oregon, is organizing just such a show, coming up on Fourth Friday this week! I spent the last two weekends painting 5 pieces for the show. 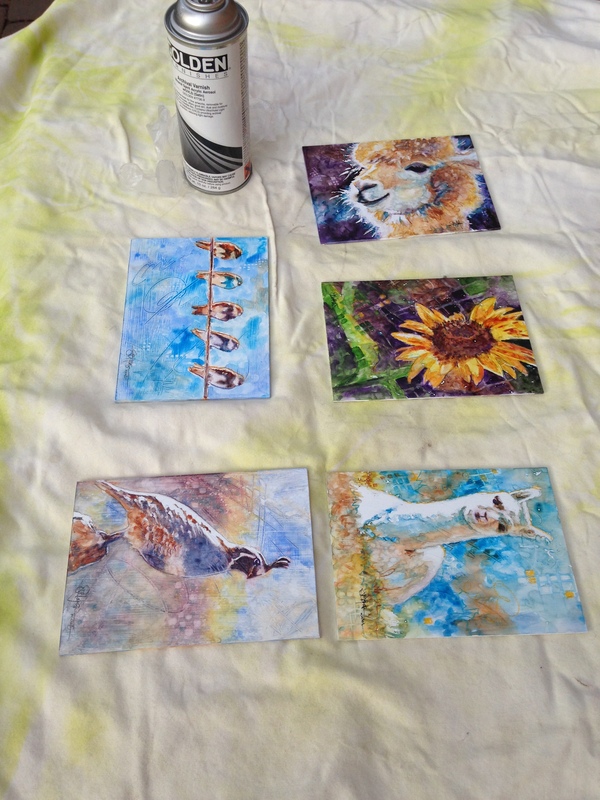 In spite of the cold weather, I managed to lay them all outside and spray them with varnish. I lay the paintings on an old sheet, and spray them with several coats of varnish. The varnish is NASTY stuff, with so many warnings on its label, like you are playing with death and pray to the paint gods you won’t melt away on the spot. You remember what happened to the bad guys from Raiders of the Lost Ark? The melting-face thing? Yep. Like that. I always try to coat the paintings outdoors, hold my breath, cover my face and hands, and run like the dickens after I spray. Once dry? All is well. No problems. Like nothing ever happened. 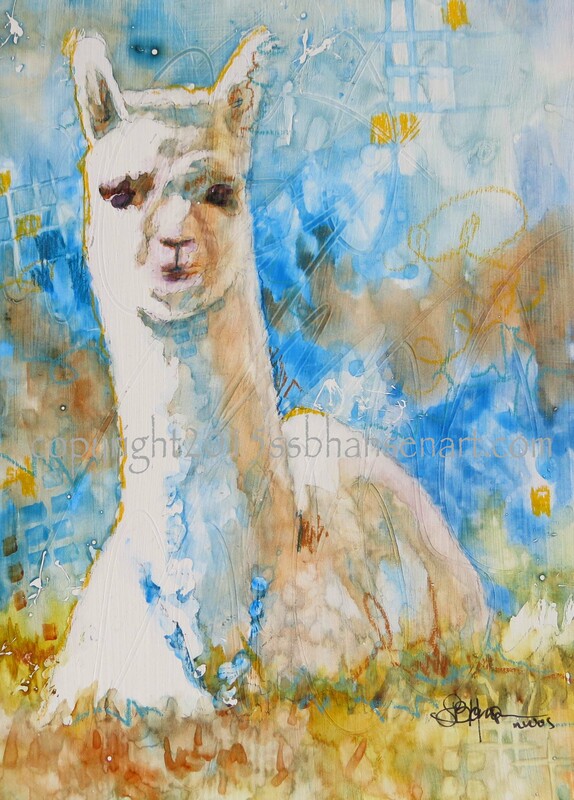 Lucky for all you animal and alpaca lovers out there, two of the works are, yep, you guessed it…alpacas! Why? Son3 and I took a trip to an alpaca farm recently and I went a little nuts with photos. 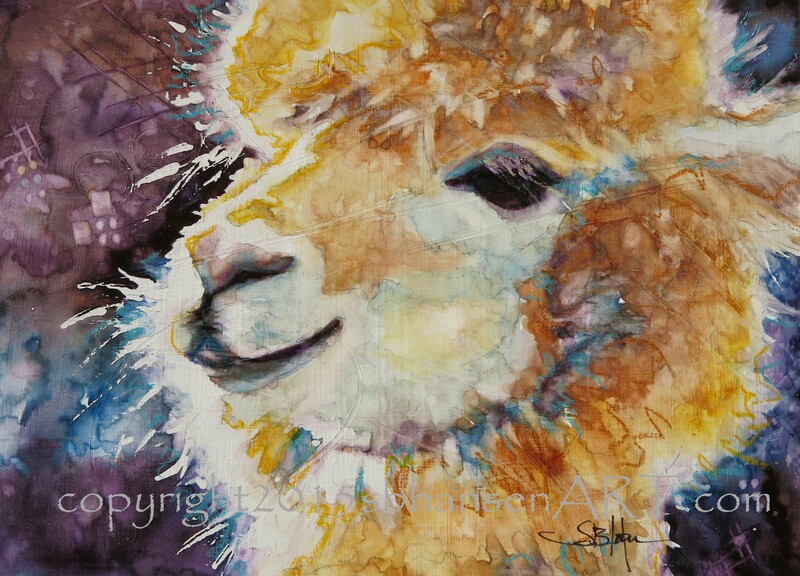 I’m telling you now, if you haven’t gotten up close and personal with alpacas yet, put it on your bucket list. They are very unique, special animals. Soft and warm and fuzzy, too. This little guy was hanging out next to his mom in the pasture, wondering what the heck we were doing. He looked so cute! And a little concerned, maybe? Should I get up, Mom? I think this next alpaca’s name is Carmel, but sorry to the Snow Diamond Alpaca folks if I’m not correct. I know one of them was “Carmel”, but…? The deep purple and rich teal set off his plush carmel-colored fibers in the afternoon sunlight. Am I right? Another FAVORITE painting of mine (sheesh, I always say that, don’t I?) turned out to be a quail. 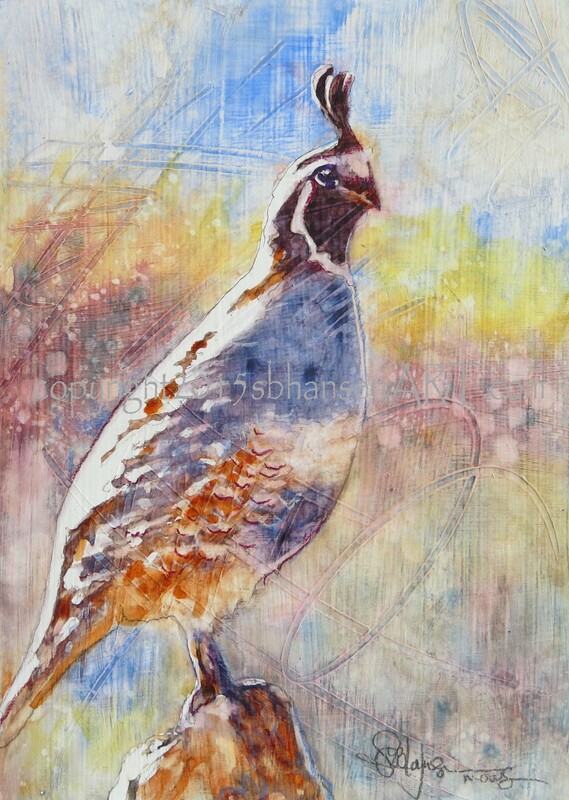 We have plenty of quail here in Central Oregon, usually clucking and calling to each other in the shrubs. Typically, a male will sit atop a branch, rock. or wall, and survey his harem of women and chicks bobbing about to eat their way across the yard. My son (kudos to him) took a great pic this summer of just such a guy, watching over his folk. Isn’t it a cool painting? I love the colors, and the light grids in the background. It’s very tactile. 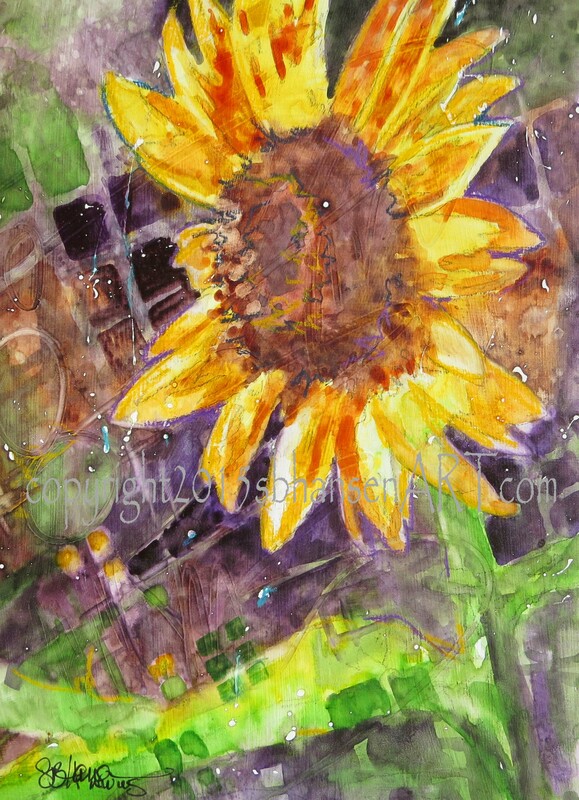 The next painting is one of the happy flowers, a sunflower. I named it “The Window” because they are frequently in yards and viewed through a window, their sunny disposition giving us all hope for the day. 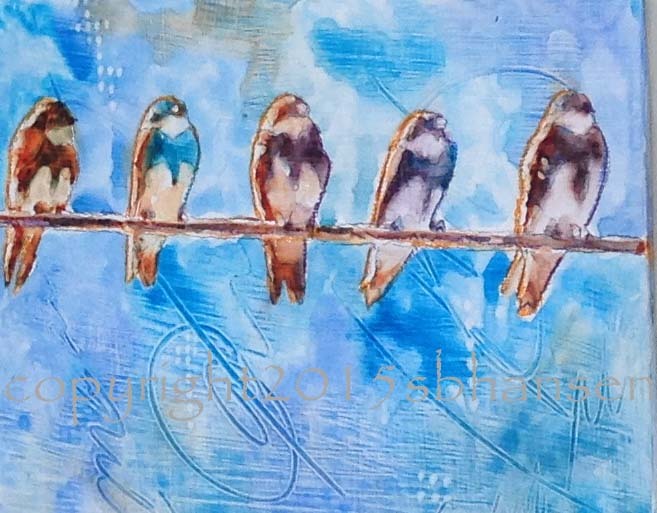 Finally, another one of my favorites, from a photo I took during our trip to Steen’s Mountain this summer; several swallows on a wire. LOVE THIS!! Here is the really bad thing about the above photo. I took pictures of all my paintings, as usual, but FORGOT THIS ONE! I will have to return to the gallery and take it outside, and take a photo. The photo above is not good enough quality-wise to make prints and reproductions. Argh! I’m losing it, people. Anyhoo, live and learn, right? 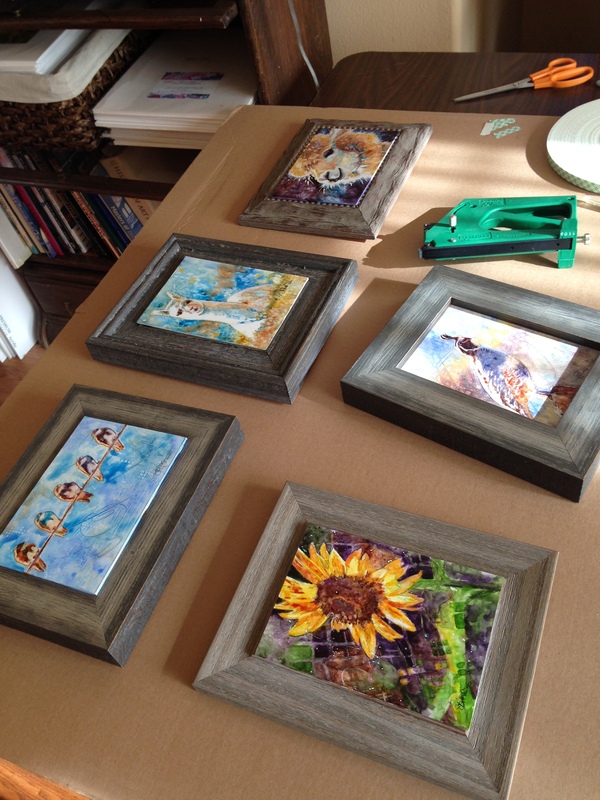 Denise at Sage Framing made me thick, barnwood-like frames for these little gems. I assembled all in my studio. Love, love, love the frames. Thanks, Denise! It is always fun to break away from the regular routine and do something different. I enjoy holiday mini shows, and this is no exception. Especially since it is the first year I painted my minis on Plexiglas and varnished like my larger work. You must stop by Hood Avenue Art on your way through Sisters and look at all the beautiful paintings from the gallery artists, running through December. Who knows? Maybe you will find that perfect gift! All above images available in greeting cards and prints.